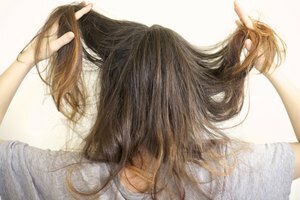 Harsh weather, hats, stress, heat and overuse of styling products can lead to hair damage. Both men and women find the lace front wig eliminates some damage because it gives the hair a rest. Lace front wigs also are a convenient way for men and women to enhance their personal glamor level. When the wig is removed for shampooing and cleaning of the hair and scalp, the excess glue around the hairline of the wig also should be removed using acetone. Grab a plastic bowl and pour 100 percent pure acetone inside, placing the bonded area in the liquid. 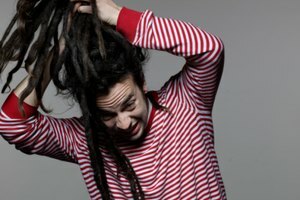 Do not place the whole wig in the acetone as it will cause damage, according to a Celebritystylewig.com Quick Tip Video. Eight to 10 minutes will pass before the adhesive begins to dissolve and lift from affected area. Dissolved adhesive will appear in the bottom of the bowl. Flake the remaining glue, if any, off of the wig. Repeat steps until all adhesive is removed. Follow by shampooing the wig per manufacturer's instructions. Once the lace front wig is applied, sometimes there is excess glue around the hairline. 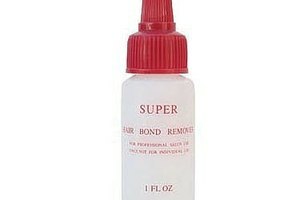 This can be removed with commercial bond remover especially made for lace front wig application or with cold cream. Oil will loosen the bond's holding ability over time. According to Lacefront-wig.com, a lace front wig is a natural looking wig that gives the illusion that hair is growing from the scalp. In order to achieve this look, various types of delicate lace are used. Commonly, French or Swiss lace is used for the base and strands of hair are hand knotted into the lace using a latch-type maneuver. Although there are different types of lace used as a base, generally there will be a more sturdy lace (French) or a more delicate and undetectable (Swiss) lace used. An adhesive is applied around the entire hairline to secure the wig. Different adhesives provide varying bonding lengths. Some wigs can be held in place for weeks and some for days, depending on the adhesive used. Because the wig is bound around the entire hairline, high ponytails and up sweeps may be worn without detection. Also, the hair underneath the wig is not being manipulated or tugged in any way so that it may grow undisturbed. The only requirement is that the natural hair underneath the wig is as flat as it can be to the scalp so that the wig application is smooth. As far as hair loss, the natural hairline will have adhesive applied near it or to it. There may be a varying amount of hair loss where the adhesive is applied, depending on the placement of the wig. Lace front wig adhesives vary. On Hairdirect.com, there is a list of tapes and liquid adhesives that can be used. The bonding strength is from one day to more than a month, depending on the type of adhesive used. Moisture and heat will affect the bond. If this happens, remember not to manipulate the unit until the bond has re-hardened, the website said. Even with the strongest bond, maintenance to the piece will be necessary to remove dirt and grime. This is done in the shower, according to Hairdirect.com, following manufacturer's instructions.